Birgit Fischer won her first Olympic medal at age 18. 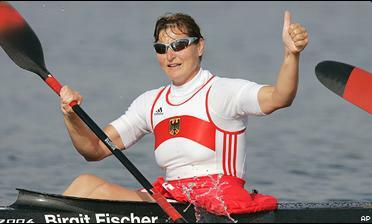 Winning never gets old for Birgit Fischer. The German kayaker picked up her eighth career gold Friday, then settled for her fourth silver Saturday. "I'm not at all disappointed," she said. "At 42, what else can you expect?" Pavol and Peter Hochschorner took the gold medal once again in pairs canoe slalom Friday, winning by more than 3 seconds. Rebecca Giddens of the United States won the silver in the kayaking single slalom. Some Olympic athletes have accepted the increased security here in Athens. The U.S. slalom canoe/kayak team has embraced it. Joe Jacobi and Matt Taylor are the oldest members of the U.S. canoe/kayak team, but they're still having fun. Former kayaking world champion Rebecca Giddens and Olympic canoeing gold medalist Joe Jacobi will compete for the United States in Athens next month.